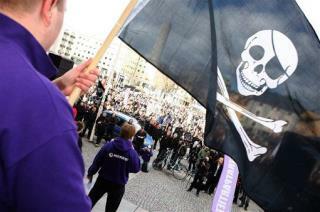 (Newser) – The Pirate Party, a Swedish pro-piracy political party, has agreed to host servers for Wikileaks. The party, which also runs The Pirate Bay, a popular file sharing site, says supporting Wikileaks is in line with its commitment to copyright and patent reform, notes Information Week. "We want to contribute to any effort that would increase transparency and helps to keep the powerful in check," the party's leader says. Wikileaks founder Julian Assange visited Sweden this week and the parties reached a deal under which the "pirates" would provide bandwidth and host Wikileaks servers free of charge, reports Gizmodo. For the plan to work, however, the party must win a seat in Sweden's parliament, which would make it impossible for authorities to legally shut its servers down. It may sound far-fetched, but these digital swashbucklers already won a seat at the EU. The masses shall take back this planet. Domestic terrorism, exposing intelligence officers around the world. What don't these people understand? We don't live in a utopia of peace and rainbows. We're fighting multiple wars, we have enemies and people that want to kill us all.